As the snows that blanket the higher elevations of the West melt and the ground thaws in spring and summer, a blanket of wildflowers begins to bloom. Beargrass sprouts its tall, bulbous stem full of small, white flowers. Purple fireweed grows rampantly through the charred remains of recent forest fires. On open, grassy slopes, the bright yellow blossoms of arrowleaf balsamroot carpet a hillside for a brief moment in time. 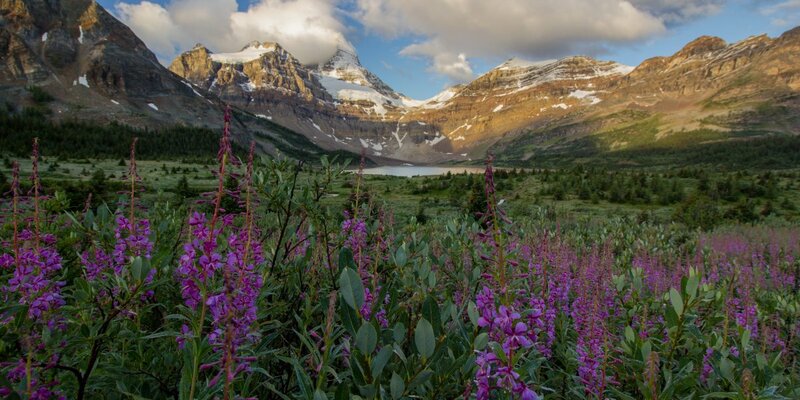 At every elevation in the mountains of the West, wildflowers bloom from early spring to late summer and bring these amazing landscapes to life. Animals come for the fruits and bees for the pollen, collecting and propagating what they can before the cold and snow returns. As a rule of thumb, follow the last melt of snow in higher elevations and the wildflowers aren't far behind. 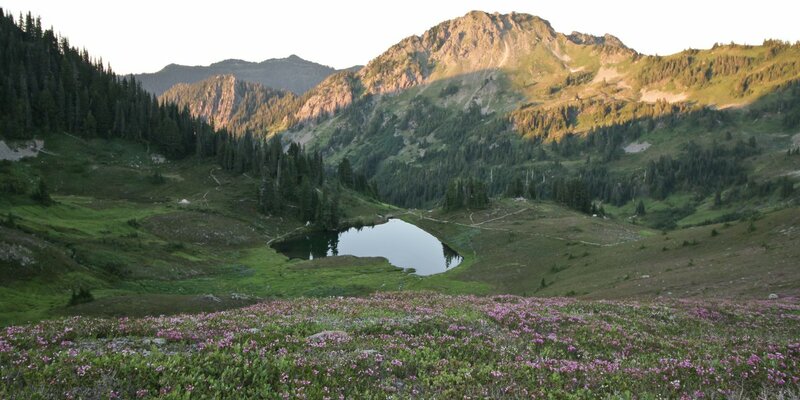 But there are a few places where these blooms are especially beautiful, where you can camp beside a high mountain lake and take in the fresh alpine air while tromping through fields of flowers and grasses. 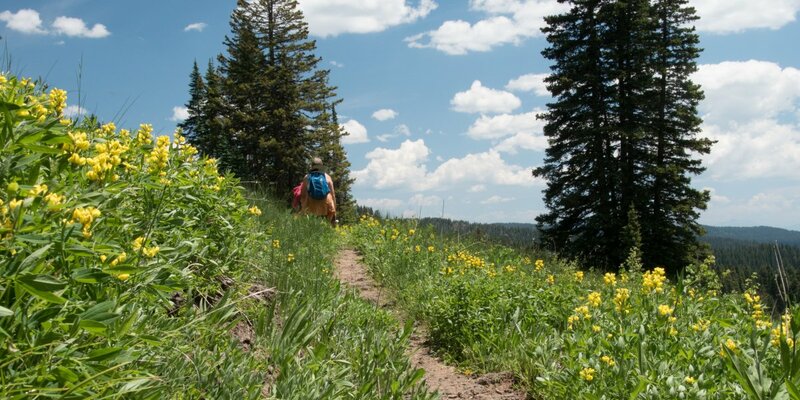 Here are five such places per state and province in the West that from early summer to early fall will be a great place to go hiking when the flowers are in bloom. Wildflowers on the High Divide Trail. Photo by Heron Marychild. Dewey + Anderson Lakes in the Mount Rainier area. Wildflowers bloom from late July to late August. Maple Pass Loop Hike in Washington's North Cascades. Wildflowers bloom in late July to late August. Hoh to Sol Duc via High Divide Trail in Olympic National Park. Wildflowers on the High Divide bloom from July through August. Killen Creek to High Camp on Mount Adams. Summer wildflowers in July through September. Goat Lake north of Mount Adams. 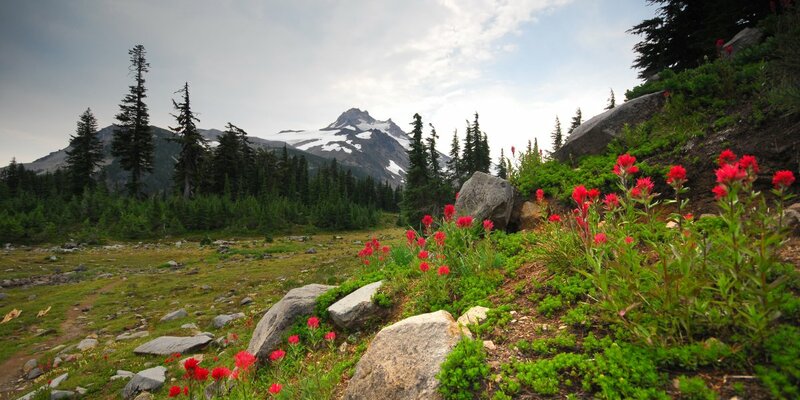 Snows melt in late July and wildflowers bloom from late July through September. Magenta paintbrush in Jefferson Park. Photo by Tyson Gillard. Burnt Lake + Zigzag Mountain in the Mount Hood area. Wildflowers bloom from late June to August. Yocum Ridge on Mount Hood. Wildflowers bloom from July through August. Jefferson Park on Mount Jefferson. Summer wildflowers in July to early September. Broken Top Crater in the Three Sisters Wilderness. Wildflowers bloom from August to late September. Elkhorn Crest Trail in the Blue Mountains. Wildflowers bloom from July through August. 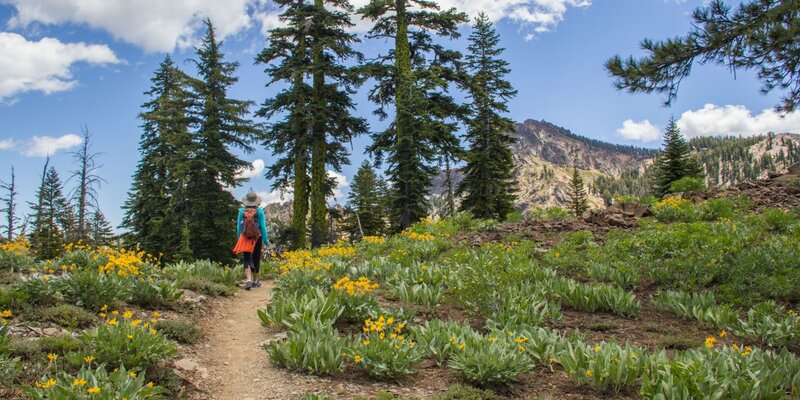 Wildflowers bloom on the Sierra Buttes Trail. Photo by Aron Bosworth. Mount Tallac Summer Trail in Lake Tahoe. Wildflowers bloom in early summer. Four Lakes Loop in the Trinity Alps Wilderness. Summer wildflowers in July to early September. ​Sierra Buttes Trail near Lake Tahoe. Wildflowers bloom in early summer. Cathedral Lakes Trail in Yosemite National Park. Summer wildflowers in late June to early August. Glacier Pass, Sawtooth Pass + Big Five Lakes in Sequoia National Park. Wildflowers in July and August. Wildflowers in the valley above Lake Magog. Photo by Daniel Sherman. Ring Lake Trail near Whistler. Wildflowers bloom in late spring and early summer. Brew Lake near Whistler. Wildflowers bloom in July and August. Wedgemount Lake in Garibaldi Provincial Park. Wildflowers bloom in July and August. Lake Magog via Bryant Creek + Wonder Pass in Mount Assiniboine Provincial Park. Wildflowers bloom in July and August. Skywalk Trail, North Loop in Whistler. Wildflowers bloom in late spring and early summer. 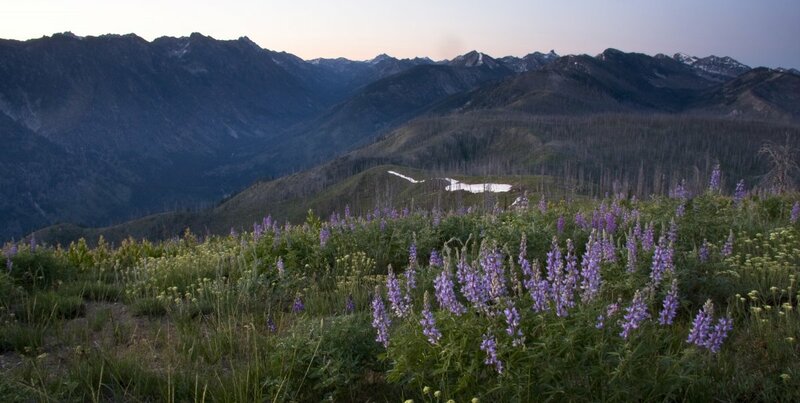 Lupine blankets the summit of Picket Mountain in late July. Photo by Matt Leidecker. Alpine Way Trail, Fishhook Creek to Iron Creek near Stanley. Wildflowers bloom in spring and early summer. Elizabeth Meadow in the Sawtooth Mountains. Wildflowers bloom in July and August. Eureka Gulch in the Sawtooth Mountains. Wildflowers bloom in July and August. Picket Mountain Trail in the Sawtooth Mountains. Wildflowers bloom in July and August. South Fork of the Payette River, Everly Lake, Plummer Lake + Everly Divide in the Sawtooth Mountains. Wildflowers bloom in July and August. 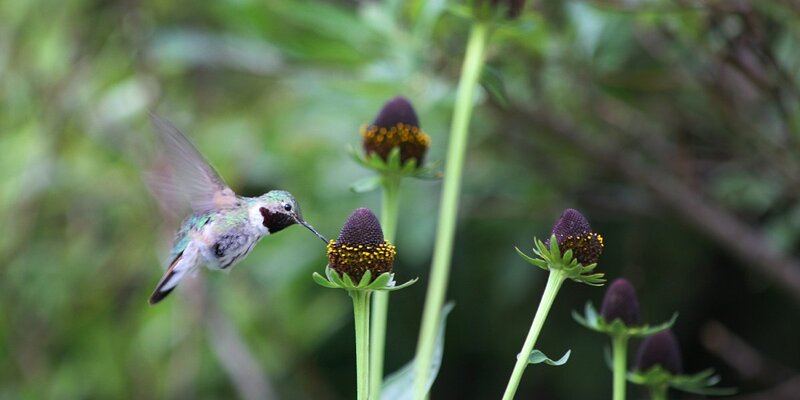 A ruby-throated hummingbird in spring on Catherine's Pass Trail. Photo by Kyle Jenkins. Broads Fork Trail in the Wasatch Mountains. Wildflowers bloom in late spring and early summer. Lake Blanche Trail in the Wasatch Mountains. Wildflowers bloom in late spring and early summer. Mount Peale in the La Sal Mountains. Wildflowers bloom in July and August. Delano Peak in the Tushar Mountains. Wildflowers bloom in late spring and early summer. Catherine's Pass Trail in the Wasatch Mountains. Wildflowers bloom in late spring and early summer. Golden Banner carpets the meadow on the Crags Crest Trail. Photo by Denis LeBlanc. Crags Crest Trail in Grand Mesa. Wildflowers bloom in late spring and early summer. Fancy Pass, Missouri Lakes in the Holy Cross Wilderness. Wildflowers bloom in July and August. Long Lake, Lake Isabelle + Pawnee Pass outside of Boulder. Wildflowers bloom from July to September. Redcloud Peak + Sunshine Peak in the San Juan Mountains. Wildflowers bloom in July and August. Zirkel Circle in the Mount Zirkel Wilderness. Wildflowers bloom in July and August.